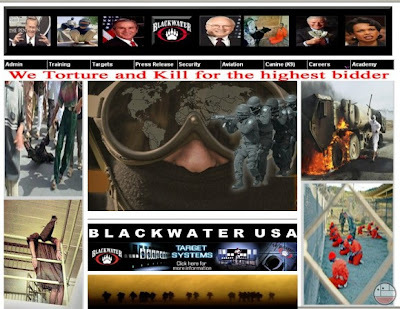 An executive with North Carolina-based private security contractor Blackwater USA has joined Republican presidential candidate Mitt Romney as a senior adviser, the campaign said Thursday. "WBT/SIL have been accused of scientific and political infiltration and espionage; control of foreign territory; violation of sovereignty; being a religious trans-national corporation; conspiracy with the CIA ... "
Wycliffe Bible Translators (WBT) are a fundamentalist, millenarianist missionary organization who have a long history of using their belief in the doctrines of original sin, and the damnation of all unconverted people to justify any behavior. Together with other groups such as the New Tribes Mission, they have embarked on a quest called Vision 2025, to evangelize to every last uncontacted society on earth, largely because they believe that in doing so they will bring about the second coming of Christ and the end of the earth. Because their interpretation of Christianity encourages obedience to Authority and justifies acquisition of material wealth, they have enough financial support to make a go of it, particularly from people connected to corporations and governments that have interests in the natural resources where these tribal societies live. The Summer Institute of Linguistics (SIL) presents itself as a scientific organization focusing on previously unwritten and untranslated languages. They have a number of programs and schools at which they teach people how to translate these languages. One of these programs operates out of Northwest Christian College in Eugene, a program that the University of Oregon will give students credit for. SIL and WBT are the Same Organization. Both have their roots in Camp Wycliffe, which was founded in 1934 to train missionaries in linguistics to facilitate their work with indigenous peoples, primarily in the Americas. In 1942, Wycliffe alumni incorporated as two separate organizations, WBT and SIL, as a clever way to get around laws banning missionaries from working in countries including Mexico. It is a ruse that has continued to serve them quite well. WBT remains in the U.S. as the fundraising and recruiting wing, emphasizing the religious aspect of their operations, while SIL arranges fieldwork and deals with governments, and gives the venture a veneer of scientific legitimacy. SIL and WBT have historically tried to deny their connection, until 1953 when they were outed by, of all people, the Catholic Church. Since then they have tried to explain it with statements like "SIL and WBT are the same people, but it is a question of two corporations dedicated to different things." Tidy, but logically somewhat dubious. Evangelical ethnocide is defined as the stigmatization, demonization and ridicule of beliefs rites and symbols of indigenous cultures while glorifying missionaries own world and own culture as the only path. By entering, uninvited, into a society and attempting to foist an alien system of beliefs and morality on them, all missionaries engage in ethnocidal behavior. By identifying godliness with capitalism and the American way of life, WBT/SIL carry out this process to a particularly fanatical extreme. Their focus on societies with little or no previous contact with the industrialized world make them especially dangerous. Arriving in the bush in flying machines bearing penicillin and metal tools, they can easily present themselves as messengers from a society and religion where all of lifes problems have been solved by the grace of their god. They provide no context with which to understand and analyze the price of development. Furthermore, by entering and building airstrips in previously impassably remote areas, they blaze the trail for governments, the military, and corporate interests. This is, of course, fundamental to their purpose. WBT/SIL have been accused of scientific and political infiltration and espionage; control of foreign territory; violation of sovereignty; being a religious trans-national corporation; conspiracy with the CIA; detection and extraction of strategic materials; clandestine landing strips; intrigue; sterilization without consent, and much more. Although many of these allegations remain unproven, some things, such as SILs collaboration with the CIA in counter insurgency in Latin America and in South East Asia during the Vietnam War, as well as their cozy relationship with numerous dictatorships, and the funds they receive from both the CIA and western multinationals are quite well documented. They get away with this, in your town and around the world because there is very little known about what they do. 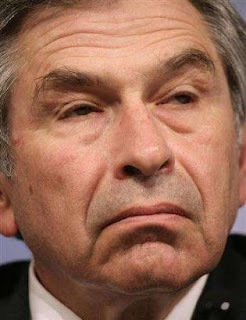 While the world's press has been fixated on the teeny-weeny scandal over whether the World Bank president Paul Wolfowitz helped to get his girlfriend a $300,000-a-year gig next door, they have been ignoring the rancid stench of a far bigger scandal wafting from Wolfie's Washington offices. This slo-mo scandal isn't about apparent petty corruption in DC. It's about how Wolfowitz's World Bank is killing thousands of the poorest people in the world, and knowingly worsening our worst crisis - global warming - every day. Let's start with the victims. Meet Hawa Amadu, 70-something, living in the muddy slums of Accra, the capital of Ghana, and trying to raise her grandkids as best she can. Hawa has a problem - a massive problem - and the World Bank put it there. She can't afford water or electricity any more. Why? The World Bank threatened to refuse to lend any more money to her government, which would effectively make it a leper to governmental donors and international business, unless it stopped subsidising the cost of these necessities. The subsidies stopped. The cost doubled. Now Hawa goes thirsty so her grandchildren can drink, and weeps: "Am I supposed to drink air?" She is not alone. Half a world away, in Bolivia, Maxima Cari - a mother - is also thirsty. "The World Bank took away my right to clean water," she explains. In 1997 the World Bank demanded the Bolivian government privatise the country's water supply. So Maxima couldn't afford it any more. Now she has to use dirty water from a well her villagers dug. This dirty water is making her children sick, and she is sullen. "I wash my children weekly," Maxima says. "Sometimes there's only enough water to wash their hands and faces, not their whole body ... This is not a nice way to live." The newly elected socialist government of Evo Morales is planning to take the water back - and he is, of course, condemned and threatened by the World Bank. Meet some more victims. I have met hundreds, from Africa to Latin America to the Middle East. Muracin Claircin is a rice farmer in Haiti - only he can't grow rice any more. In 1995, the World Bank demanded Haiti drop all restrictions on imports. The country was immediately flooded with rice from the US, which has been lavishly subsidised by the US government. The Haitian government barely exists and can't offer rival subsidies anyway: the World Bank forbids it. So now Muracin is jobless and his family are starving. Some 5,000 miles away, Charles Avaala in Ghana is watching his tomatoes rot. He used to grow them for a government-owned community tomato cannery that provided employment for his entire community. The World Bank ordered his government to close it down, and to open the country's markets to international competition. Now he can't compete with the subsidy-fattened tomatoes from Europe. He, too, is starving. How would Hawa and Maxima and Muracin and Charles feel if you told them none of this is considered a scandal, but business as usual? These victims are not merely an anecdote soup; they are an accurate summary of the World Bank's effect on the poor. Don't take my word for it. The World Bank's own Independent Evaluation Group just found that barely one in ten of its borrowers experienced persistent growth between 1995 and 2005 - a much smaller proportion than those who stagnated or slid deeper into poverty. The bank's own former chief economist, Nobel Prize-winner Joseph Stiglitz, says this approach "has condemned people to death... They don't care if people live or die." Why? Why would a body that claims to help the poor actually thrash them? Because its mission to end poverty has always been mythical. As George Monbiot explains in his book The Age of Consent, the World Bank was created in the 1940s by US economist Henry Dexter White to be a further projection of US power. The bank's head is invariably American, the bank is based in Washington, and the US has a permanent veto on policies. It does not promote a sensible mix of markets and state action - the real path to development. No: the World Bank pursues the interests of US corporations over the poor, every time. The bank's staff salve their consciences by pickling themselves in an ideology - neoliberalism - that says there is never a conflict between business rights and human rights. If it's good for Shell, it must be good for poor people - right? This ideology also backfires on us in the rich world. In 2000, the World Bank was finally forced to undertake a review of its energy policies. It did its best to rig it, putting the former energy minister of the corporation-licking Indonesian dictator General Suharto in charge. Emil Salim was even serving on the board of a coal company at the time he was appointed. But - to everyone's astonishment - Salim concluded by opposing the carbon-pumping oil and gas projects that make up 94 per cent of all the bank's energy projects. He said they should be stopped altogether by 2008. The bank's response? It ignored its own report and carried on warming. The business climate, it seems, trumps the actual climate. Feel the heat. While the elites huff and puff about Wolfowitz's alleged small corruption and ignore his organisation's proven immense corruption, there is something we - ordinary citizens - can do. In the summer of 2001, at the global justice protests in Genoa, I met Dennis Brutus, a former inmate of Robben Island prison alongside Nelson Mandela. He had been repelled by the bank's actions in South Africa, and started his protests against them by asking a very basic question: who owns the World Bank? It turns out we do. Ordinary people in the West - through their trade unions, churches, town councils, universities and private investments - own it. The bank raises nearly all its funds by issuing bonds on the private market. They are often held by socially minded institutions, the kind who signed up to Make Poverty History. So, Brutus realised, we have a simple power: to sell the bonds and bankrupt the World Bank. "We need to break the power of the World Bank over developing countries just as the disinvestment movement helped break the power of the apartheid regime in South Africa," he explained. The campaign to make World Bank bonds as untouchable as apartheid-era investments has already begun. The cities of San Francisco, Boulder, Oakland and Berkeley have sold theirs. Several US unions have also joined. Even this small ripple has caused anxiety within the bank about the threat to its "AAA" bond rating. In the Genoa sun, as tear gas fired by the Italian police hissed in the background, Brutus told me: "I lived to see the death of political apartheid. Now I want to live to see the end of global financial apartheid." This is the fight we should join. Not some petty squabble over which Washington technocrat is morally pure enough to lead the forces of subsidy-slashing and starvation.